The Mlais MX Base suffers from some of the creaky bits you might expect of a cheap no-brand Chinese phone. However, its epic battery life and perfectly good screen make it a surprisingly good pick for those after a budget road warrior. Phones have become faster, their cameras have got better, and a slim phone of a few years ago would seem like a porker today. However, one thing that hasn't improved much is real-life phone stamina – most of us still find that we have to charge our phones each and every day. The mission statement of the Mlais MX Base is to change that. It packs a radically huge 4300mAh battery – the sort of size you might usually find in a tablet. Haven't heard of Mlais? You're not alone, because this is one of those tiny Chinese brands producing phones you'll never, ever see on the high street in the US or UK, outside of a dodgy second-hand electronics store, anyway. This raises concerns about the Mlais MX Base's longevity, which are absolutely worth considering in our opinion. But it also makes the Mlais MX Base extremely price-competitive. It sells for £89 (around US$135, AU$185) if you shop around - although the main site has it for slightly higher, and – spoiler alert – it does have much better stamina than any other Western phone in this class. Would we advise buying one over a Moto G 3rd-gen and, say, a 10,000mAh OnePlus or Xiaomi battery pack? Probably not. However, Mlais has proven, once and for all, that it is absolutely possible for a company to make a phone that lasts, well, ages. The well of no-brand Chinese phones is deep, and its contents multifarious. Stick a hand in and you might find a good one, or burn a finger on a dodgy melting battery. The Mlais MX Base seemed a case of the latter when I initially got the phone: for the first couple of days on charge, the phone refused to turn on at all. I was about to bury the little guy in his cardboard coffin for good when he sprung to life as if I hadn't been pressing his power button dozens of times in the days previous. This just serves to reinforce the notion that buying a low-price Chinese phone can be a gamble, because quality assurance standards are going to be so much lower than if you buy a phone from, say, Sony or Samsung. If you see a phone on sale from one of the big manufacturers or networks, you can figure that it's been through approximately a billion tests. This phone? Rather fewer. That said, in the week-plus since waking up, the Mlais MX Base has worked just fine. Not a single restart or major blip. And, given its gigantic battery, it's actually tremendously easy to live with. The MX Base is 9.9mm thick and weighs 168g. That's not slim, and it's not light; but it's also not the pocket-bulger you might imagine of a phone whose sole purpose is to pack in the biggest battery you've ever seen in a 5-inch handset. There's nothing too clever behind this feat either, and you can take the Mlais MX Base's back cover off and get a good look at the 4300mAh battery cell. It's the standard brick you'd have encountered before every phone maker started locking their batteries in like high-security prisoners; it's just a bit bigger. The Mlais MX Base has a bit of reassuring heft to it, but much of that comes from the weight of the battery. This is otherwise a pretty cheap-feeling phone, with all the sense of style of a white bread cheese sandwich. It's plain, with only the fake brushed-metal plastic strip along the phone's edge to jazz things up a little. Elements like the non-illuminated metallic soft keys look a bit cheap too. The question is: does this matter? If you want a phone that lasts for approximately forever off a charge, and are only willing to pay £89 (around US$135, AU$185) for it, then asking you to trade away premium build and style doesn't seem like too great an ask. I also prefer the Mlais MX Base's plain look to something that tries to stand out, but succeeds only in making you wince. One element you may want to think a bit more seriously about is the screen covering. It's glass, and toughened glass at that, but it flexes a little more readily than the Gorilla Glass 3 you get in the Moto G 3rd-gen, and countless other reasonably affordable mobile phones. I've been using the phone for more than a week, though, it hasn't picked up any major scratches. I've seen much worse supposedly toughened glass before. The Mlais MX Base offers much more than better-known rivals in other areas too. For example, it has 16GB storage when at this price you'd normally only get 8GB, max. It also has an IR blaster, a useful little gadgety extra that even top-end phones like the Samsung Galaxy S6 started leaving out this year. Samsung did this because basically no-one used the IR transmitter in the Galaxy S5, but it's still pretty neat. An IR blaster can mimic the signals sent by the old-fashioned remotes used by your TV, home cinema receiver and so on, enabling the Mlais MX Base to act as a universal remote. 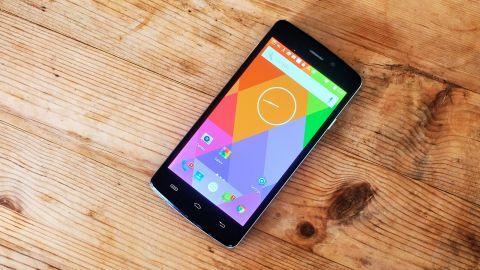 There's an app to enable you use it too – it's a bit ropey, but there are plenty of better alternatives available from Google Play, and that you get the feature at all in a phone this cheap is an eye-opener. It has 4G too, and all the primary Western bands are supported. There's no NFC, though. The screen is a little more ordinary, but still competes pretty well with the best at this price. The Mlais MX Base has a 5-inch 1280 x 720 pixel IPS LCD display, which has become the gold standard for budget phones. It's not a bad screen at all. The colours look fairly natural, only showing a slightly cool temperature, and lacking some of the subtlety of the best. You can customise all this, though. In the Settings menu there's a very in-depth screen tweaker tool that enables you to alter image contrast, temperature and the dynamic contrast system, which aims to increase the punchiness of images. As with the Moto G and other 5-inch 720p phones, sharpness isn't quite Retina-grade. But it's still pretty good. The one issue with the display is that my Mlais MX Base has some backlight bleed, which is where areas of the display look brighter than others – in this case it's a touch of classic edge-of-screen bleed. It's no surprise in a low-budget phone from a maker with, most likely, less rigorous QA standards than some – there's a level of 'accepted' compromise at this price range, and plenty of cheaper phones from big names suffer from this effect too. Here the bleed is pretty minor stuff, though, and if I'd bought this phone I wouldn't be looking for a refund.